2. You can make money. 3. You can get tax deductions. 4. 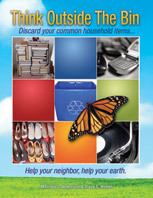 You won’t be contributing to the landfill. 5. You could impact the lives of others in need. This entry was posted in Social Recycling. Bookmark the permalink.